Data show that when the Iceland hot spot—the heat source that feeds volcanoes on Iceland—passed under north-central Greenland 80 to 35 million years ago, it left molten rock deep underground but did not break through the upper mantle and crust to form volcanoes as it had in the west and east. The Earth's climate then was too warm for Greenland to have an ice sheet, but once it cooled the ice sheet formed, growing and shrinking successive with ice ages. @Bart_A You seem not to care about geology or the movement of magma or this interesting hypothesis of transitory ancient warming from below. Have you considered that perhaps you don't belong here? waiting to find that placer gold. Considering that if the Iceland hotspot is moving east, this isn't likely to traverse Greenland again, and this doesn't sound like "future." Another clickbait physorg title. gee, an ice-free Greenland in exchange for some crappy welfare supported islands or creaky old N. American coastal cities? Sounds good. Bart's not very bright. I wouldn't bother responding to one of the "Christian" psychotics. It will just encourage it to post here more. Feel free to go live there, @ThoriumBoi. Maybe the coastal cesspool gangs who have more guns than you do won't catch you there. I am totally over worrying about how many guns a bunch of idiots in low-population states have. Prepare for more people, angry about their cesspools overflowing when you deniers said they wouldn't, coming for you with more guns than you got and with ropes. And after legitimate commenters here have not been protected from threats of violence from these supposed "Christians," who keep repeating they have more guns, I see there is no restraint, and I state that if "warmers" whose lawns have been inundated with sewage seek to get revenge upon the denier liars, I will not stand in their way and will in fact help them find denier liars if I can. Are you ready to stop whining about how many guns you have, liar denier Trumpian psychotics? This is what embracing Hitleresque tactics has earned you. You will find that every state will have larger populations than you will oppose you. You will be executed as traitors. The fact that you mentioned Trump in a science article says you are the one that has the Trump derangement syndrome... Trump has made you mentally ill.
"...most of Greenland's ice can be saved from melting if warming is controlled, says a team of Penn State researchers." Really? Good luck with controlling the temperature of an ice sheet that essentially covers the entire country. It seems to be the norm today that every paper has to make outrageous, over-the-top claims, all with extremely limited data. If the USA has a war with Russia - whose side do you think Da Schneebo aka Da Schitforbrains would be on? Most likely he would go running to those gun owners to protect him when the Russian Navy lands in New York City. Better than ODS because the black dude got elected President twice, I guess. In terms of actually doing the job, he seems to have presided over the elimination of wars. Most people don't get this, but most of what the President does domestically is controlled by Congress appropriations. It's in foreign policy that a President stands or fails. Trump denigrates the US' foreign policy of decades. He's an idiot. A little perspective: at the current rate, if the measurements are accurate (they aren't), it will take more than 10,000 years for the Greenland ice sheet to completely melt and contribute those 23 feet to sea level rise. More recent weigh-ins suggest the ice sheet is not losing nearly as much as in the prior decade. Regardless of the relatively large uncertainties, 10,000 years should give us time to, you know, migrate further inland. Unless another Milankovitch-cycle induced glacial period begins and melting ice is no longer a "problem". Of course no one bothered to check the actual paper or discuss much what it means. It is proposing (an interesting) hypothesis, no more. The consequences depends on if the hypothesis can be tested correct or not. It seems to be the norm today that every paper has to make outrageous, over-the-top claims, all with extremely limited data. The problem is that the sea level is increasing now, and this ice sheet is contributing now, and the amount of data - which is fair to middling and not "limited" in most sense - suffice to say that as well as (mostly) what we can and cannot do. Also, please provide peer reviewed references akin to how the research papers do. Claims without evidence can be rejected without evidence. Changes to the ice sheet allowed the molten rock to move closer to the Earth's surface, even to the base of the ice. The hotter bed melted more ice from below, lubricating the ice sheet so it was thinner and easier to melt from above." "Two giant plumes of hot rock deep within the earth are linked to the plate motions that shape the continents, researchers have found." 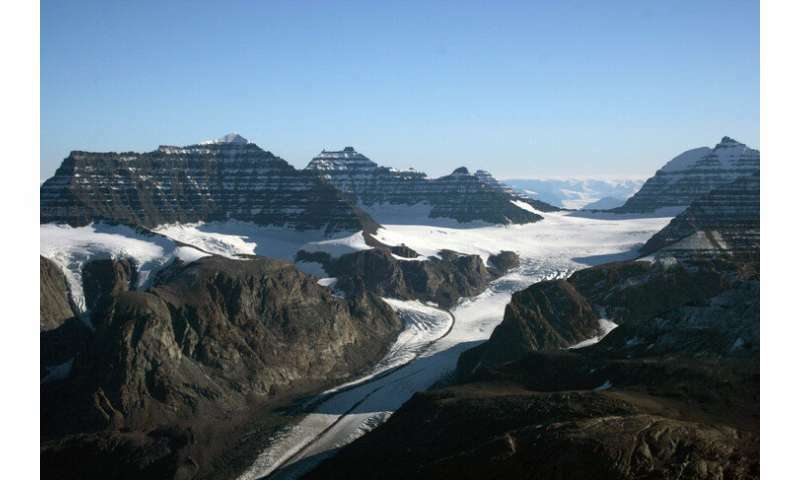 "If our conclusions are correct, every piece of land that we are now sitting on got its start someplace like the Andes or Tibet, with very mountainous surfaces," said Tang, lead author of the study and a postdoctoral research associate in Rice's Department of Earth, Environmental and Planetary Sciences (EEPS). "Today, most places are flat because that is the stable stage of the continental crust. But what we found was that when the crust formed, it had to start out with mountain-building processes." The Earth is very hot underneath the continental crust - often hot enough to warm glaciers to the point of melting. This is Fact.